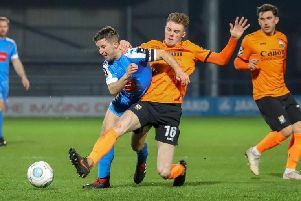 Joe Leesley said it would have been something of a robbery if Harrogate Town had emerged with anything to show from Tuesday evening's visit to Barnet. Simon Weaver's side were second best on the night, failing to seriously trouble home goalkeeper Mark Cousins until the 94th minute. And although the Bees stopper had to make a fine reaction save to keep out Mark Beck's far-post header at the death, Leesley doesn't believe the visitors did enough to warrant a share of the spoils. "We're disappointed. Their keeper has pulled off a great save, but if we'd have come away with a point we'd probably have stolen it," he reflected. "Barnet are a bit of a hit-and miss-team, but they looked a good side on the night. "They came out of the blocks quicker than us and we didn't react to it. It's frustrating." 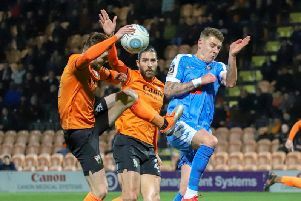 Leesley's 74th-minute substitute appearance was his first in a Town shirt since a cameo against Stockport County at the beginning of February. Initially rested by boss Weaver before suffering an ankle injury in training, the winger said his delight at returning to action was tempered by the outcome of the game. "It's been a long couple of months for me and frustrating," he added. "Obviously I'm happy to get back out on the pitch yet disappointed we couldn't get anything from the game. "We're not going to make excuses, however. We've just got to dust ourselves down because we've still got a lot to play for. "We're in no worse position than we were at the start of the night, so we've got to be positive and it's on to Barrow on Saturday." Defeat means that Town stay sixth in the National League standings ahead of this weekend's trip to tackle the 11th-placed Bluebirds.